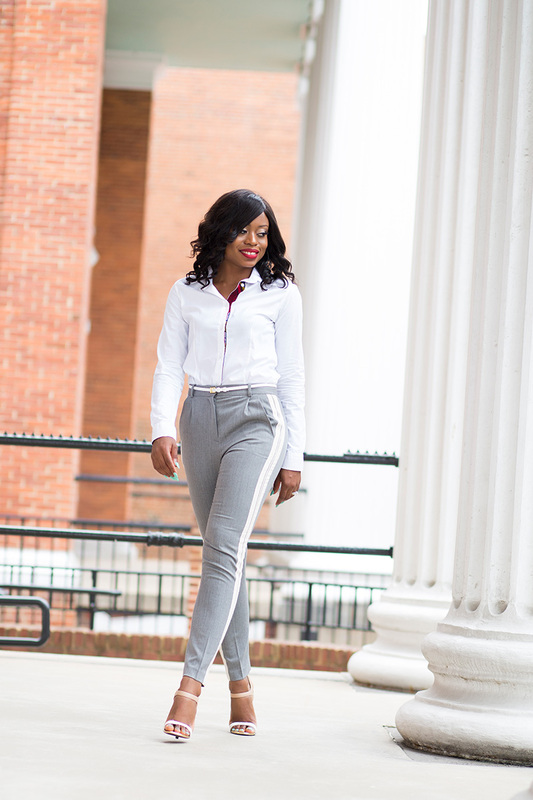 A great way to switch up a work style could be a mix of colors, prints and patterns. Subtle patterns or prints like this geo jacquard print pants, printed top or one of these KoshieO classic shirts will be nice. For today's work look, I am wearing a high rise tux trouser which has flattering stripes on the sides. The white stripes add a unique touch and to complement, I wore a classic white shirt with intricate woven elbow patches (African colored prints). I completed the look with simple strap beige/white sandals. Love the unexpected details of your top. I love the shirt details, very interesting surprise. And I love the way you paired it with the jogers and kept everything else simple. You look lovely. I love your shirt details, very interesting surprise. I love the way you paired it with the tux pants and kept every other thing simple. You look lovely. I love the Ankara details!